Automakers will dial back their spending in Canada and export fewer vehicles to the United States from Canada over the next four years, according to forecasting firm LMC Automotive. The forecaster expects OEMs to continue to increase spending and production in Mexico over the same time period, despite tariff threats and social media shaming from President-elect Donald Trump. LMC predicts Canada will be the only country in North America to see a decrease in “production capacity investment,” forecasting a four-per-cent decrease over the four-year period. Meanwhile, investment in Mexico will rise 47 per cent and investment in the United States will increase 12 per cent during the same time frame. He called the cost of labour, high electricity rates and provincial and federal plans for carbon taxes deterrents to investment. By 2020, the United States is expected to get fewer vehicles than it does today from all five automakers with facilities in Ontario, LMC said. General Motors, Ford, Toyota, Fiat Chrysler and Honda all assembly vehicles in Ontario and ship the majority of them to the United States. General Motors is forecast to suffer the biggest decrease in the number of exports. Currently, 15 per cent of GM’s U.S. sales are comprised of Canada-made vehicles, but by 2020 GM will be down to nine per cent. Ford’s percentage of Canada-built vehicles sold in the United States is projected to fall to five, down from seven; FCA’s percentage will fall to 18 from 21; Honda’s percentage will drop slightly to 21 from 20; and Toyota will see its share fall to 18 per cent, down from 20 per cent today. Faria said FCA and Honda are best positioned to at least maintain production volume in Canada because they build models popular in the United States and Canada. Honda builds the Civic and CR-V at its Alliston, Ont., operations and announced on Jan. 9 a $500-million upgrade there. FCA builds the Pacifica at its Windsor, Ont., factory, which just underwent a $2-billion upgrade in 2015. “I don’t see it as the five companies moving production out of Canada as much as they aren’t investing in Canada for any new production,” Faria said. 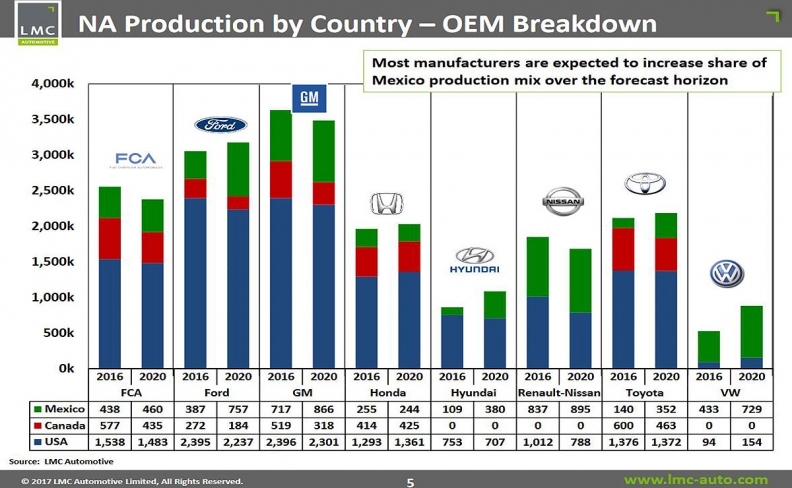 The study expects total North American production capacity will increase by three million units through 2023, and nearly half of that growth will come in Mexico. “The U.S. currently accounts for two-thirds of North American vehicle production but significant investment plans and decisions to re-source capacity from Asia and Europe to Mexico are expected to bring Mexican production from 19 per cent of NAFTA today to 26 per cent in 2020,” the study said. Despite its projections, LMC acknowledged Trump’s policies could impact future decisions by automakers. He has threatened a “border tax” on vehicles built outside the United States and plans to renegotiated the North American Free Trade Agreement. There have been several announcements of investment in U.S. operations and the cancellations of investment in Mexico in the first two weeks of 2017, but LMC said they might not have to do with Trump’s threats. “This appears to be the direct result of pressure from Trump holding to his campaign promise of penalizing companies for manufacturing outside the U.S. However, many of these decisions were already planned or were altered due to other factors, such as lower demand for small vehicles or shifting higher margin or complex vehicles to the US, and not solely the result of the pressure,” the study said. Michael Martinez contributed to this report.